Until last night, the only Chekov play I had seen was “Vanya and Sonia and Masha and Spike“. I’ll wait for that to sink in. If you don’t understand it, look at the linked Wikipedia page for Vanya and Sonia and Masha and Spike. I’ll wait. Now that my unfamiliarity with Chekov has sunk in, you’ll understand why a production of Chekov’s Uncle Vanya piqued my interest when it came across my theatrical RADAR. Combine that with the fact that it was being done by one of the best small theatre companies in Los Angeles, and it was almost a certainty I’d go. But it wasn’t up on Goldstar. Luckily, their publicist contacted me and arranged for comp tickets… which I paid for when I got to the box office (remember: I don’t take comps). So, last night, with our tummies full of wonderful Russian food (see Dining Notes below), we journeyed to Russia in North Hollywood with the Anteaus Theatre Company (FB)’s production of Uncle Vanya. I should note that the production was not super-Russian: the adaptation used was by Annie Baker, based on a literal translation of the original Russian text by Margarita Shalina and the original Russian text. This updated the language of the play to modern vernacular, although the play was not updated in any other way (including the Russian names, places, love of vodka, or tolerance of peasants). As I indicated above, my only familiarity with the play coming in was superficial, based on a play that combined various Chekov notions into a single story. I knew that it was a slice of life story; and I had a vague notion that it emphasized the dreary side of life. But that’s it. As I watched the story, I found that I kept drawing parallels to Vasha and Sonia and Masha and Spike, and it turned out that Durang’s modern play had actually kept many of the notions in the original Uncle Vanya story. Uncle Vanya tells the story of life on a Russian estate in pre-revolutionary times (probably the turn of the 20th century). Ivan Petrovich Voynitsky (Vanya) has been living on and maintaining the estate together with his younger unmarried niece, Sofia Alexandrovna Serebryakov (Sonya), his mother (and Sonya’s grandmother) Maria Vasilyevna Voynitsky, Sonya’s old nurse Marina Timofeevna, and their right-hand-man, Ilya Ilych Telegin (Waffles). Into this mundane existence comes a retired university professor, Aleksandr Vladimirovich Serebryakov, who was married to Sonya’s late mother. With him is his significantly younger second wife, Helena Andreyevna Serebryakov (Yelena). Lastly, to this mix is added Mikhail Lvovich Astrov, a middle-aged country doctor and environmentalist (well, he cares about saving the forests). The professor is old, bitter, and curmudgeonly. The doctor has the hots for Yelena, as does Vanya. Sonya has the hots for the doctor. Yelena wants none of them. Almost all the characters feel their life has been pointless, making no impact. The first two acts are a long (but interesting) introduction to the various characters and the interactions I’ve noted above. We learn who they are, what they desire, how they feel about each other, and so forth. You can find a detailed summary of what happens on the Wikipedia page; I won’t repeat it here. Essentially, it is Explain, Mix together, Shake, Stir. Post-intermission (which is logically Act II, but is really Act III), a catalyst is introduced when Aleksandr announces he wants to sell the estate, invest the proceeds, and live off the interest. This provokes Vanya into action, protesting that he and Sonya have essentially set aside any hope of happiness (and, by implication, family) by maintaining the estate and sending him money to live on. He notes that the estate is really Sonya’s, as she inherited it from her mother, Aleksandr’s first wife. Tensions mount, a gun comes out, and … boom … no one is hurt. The play concludes by everyone expressing their general disappointments, going on their separate ways, and life going on a dreary and boring as before. This may sound not all that exciting. The characters really don’t grow and change that much, although they do learn about themselves. Lives don’t significantly change. But that’s how life is sometimes, and the exploration of the story proves to be interesting, with spots of humor and drama. Chekov’s story is really everyman’s story, providing a commentary on despair and the futility of life, where it can take us, and how we just have to accept that life is what life is, and that it is sometimes boring and depressing. In other words, it is a very Russian story :-). Annie Baker’s adaptation brings the language to modern usage (for the most part), and makes the characters seem realistic and accessible. You don’t get a strong sense that this is a story that took place over 100 years ago, other than the lack of electronic gadgets and the references to horses for transportation. Robin Larsen (FB)’s direction aids in this by making the characters seem real, casual, and accessible. I’ve often wondered how to separate out the contribution of the director (although this article helped a little), but here I think the director helped the characters find the naturalism inside the people they portray, and it worked quite well. Anteaus Theatre Company (FB) double casts (excuse me, “partner casts”) each show (something they couldn’t afford to do under AEA’s proposals for LA Theatre, which is why I’m pro99 and proud). For our production, we had most of the “Mermaid” cast (all of whom were Equity members). 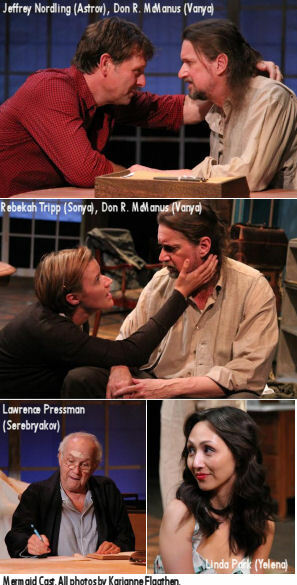 In the lead positions were Rebekah Tripp (FB) as Sonya and Don R. McManus (FB) as Vanya. I really liked Tripp’s portrayal of Sonia. There was just something about the character she inhabited that was accessible and likable and weary and hopeful and just magical, and there were points in her performance where she was wordless but just conveying so much. Her interactions with Linda Park (FB)’s Yelena were just great. Truly a fun performance to watch. McManus’s Vanya was more weary with age, but equally passionate about what his life was lacking. He reached his real fire in the second half of the show, both in his response to the proposal to sell the estate and the subsequent incident with the gun. The other main pair of characters in the story were Lawrence Pressman (FB)’s Aleksander Serebryakov (Professor) and Linda Park (FB)’s Yelena. When the story began, I wasn’t sure what to make of either character: Aleksander was an enigma, and Park seemed just to be eye candy. But as the story went on, their characters (and the actor’s portrayal thereof) grew really interesting. Pressman imbued his character with an age-appropriate weariness and view of life: he was old, and he was angry about being old and about his life not having amounted to much. Park’s Yelena proved to be much more interesting. Despite the first impression of the character, she came into her own in her interactions with the other characters — in particular, Tripp’s Sonya in the latter part of the first half and throughout the second half. She was also great in her interactions with Jeffrey Nordling (FB)’s Astrov and McManus’ Vanya. I was familiar with Park only through Enterprise, and it was really nice to see her on stage — a pleasant and unexpected surprise of a nuanced powerhouse performance. For much of the action, Jeffrey Nordling (FB)’s Astrov was the catalyst. Nordling captured the mid-life crisis of the doctor well: he felt his life hadn’t amounted to all that much, and he was much happier with his vodka and with his trees. He thought he had found a new passion in Yelena, but she really didn’t want anything to do with him (or perhaps she did, but she didn’t want to destroy her marriage or deal with all the ramifications of giving into that passion, so she was settling for the boredom instead). Nordling made Astrov come off as an affable character, but also captured the underlying anger in the character that came out when he was drunk. In supporting roles were Mimi Cozzens (FB) as Maria, Lynn Milgrim as Marina, Morlan Higgins (FB) as Telegin, and Paul Baird as Yefim. All captured their characters well. Milgrim made a nice Marina in her interactions with Astrov in the beginning of the piece, and I enjoyed seeing her character knit (one wonders if it was in the casting sheet that she could knit). Cozzens’ role as Maria (Sonya’s grandmother, Vanya’s mother) was smaller, but I did enjoy her reactions during the scenes where Vanya starts to break down and hugs here. I particularly enjoyed Molan Higgins’ music as Telegin — well performed on the mandolin and quite tuneful (and luckily, the composer and music director, Marvin Etzioni (FB) made it available to patrons of the show during the run, once they get the links fixed). According to the credits, he’s part of a band called Staggering Jack (FB) — I’ll need to look into that as I like Celtic music. In addition to Higgins music, his portrayal of the right-hand-man Telegin was quite good. Baird had a much smaller role, but was great on the accordian. I look forward to seeing him later next month if he continues in El Grande Circus de Coca Cola at The Colony Theatre (FB). As I noted above, Anteaus double casts each role; you find out which cast you have at each performance. The cast we didn’t see (the “Vixen” cast — so named because Yelena is referred to as both a Mermaid and a Vixen) is Harry Groener (FB) [Aleksander Serebryakov]; Rebecca Mozo (FB) [Yelena], Shannon Lee Clair (FB) [Sonya], Anne Gee Byrd (FB) [Maria], Arye Gross (FB) [Vanya], Andrew Borba (FB) [Astrov], Clay Wilcox [Telegin], Dawn Didawick (FB) [Marina], and John Allee (FB) [Yefim]. Turning to the technical: The scenic design by Michael B. Raiford (FB), complimented with the scenic art of Colony regular Orlando de la Paz, established a convincing estate with nice little touches (such as the samovar). The lighting design of Leigh Allen (FB) worked quite well, especially for the storm scenes. Similarly for the sound design of Christopher Moscatiello (FB), which was very convincing during the storm. Jocelyn Hublau Parker‘s costume designs weren’t particularly Russian (which was fine), and some (especially for Yelena) were clearly very modern and elegant. Rounding out the production credits: Mallin Alter (FB) [Assistant Director], Christopher Breyer (FB) [Dramaturg], Bill Brochtrup (FB) [Co-Artistic Director], Emyli Gudmundson (FB) [Rehearsal Stage Manager], Emily Lehrer (FB) [Rehearsal Stage Manager], Adam Meyer (FB) [Production Manager / Props Design], Rob Nagle (FB) [Co-Artistic Director], Matthew Sanchez [Assistant Stage Manager], John Sloan (FB) [Co-Artistic Director], Kristin Weber/FB [Production State Manager / Wardrobe Mistress]. Lastly, one of the more interesting credits buried in the progam: Ned Mochel [Violence Designer]. Uncle Vanya continues at the Anteaus Theatre Company (FB) through Dec. 6 on Thursdays and Fridays at 8p, Saturdays at 2p and 8p; and Sundays at 2 p. Tickets are $30 on Thursdays and Fridays (except Oct. 15 and Oct. 16 which are $34 and include a post-performance reception), and $34 on Saturdays and Sundays. 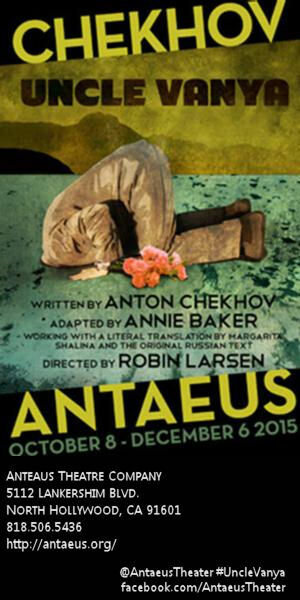 The Antaeus Theatre Company is located at 5112 Lankershim Blvd in North Hollywood, CA 91601. Parking is available for $8 in the lot at 5125 Lankershim Blvd. (west side of the street), just south of Magnolia. The theater is air-conditioned and wheelchair accessible. For reservations and information, call 818-506-1983 or go to www.antaeus.org. I did not see discount tickets on Goldstar or LA Stage Tix. Dining Notes. Given we saw a Russian play, we decided to go get Russian food before the show. Luckily, there’s a great Russian restaurant not that far from the theatre: Russian Dacha (FB) over on Laurel Canyon, just N of Magnolia. It looks to be a great restaurant for groups, but is BYOB. My wife had a delightful borscht, and we shared a great combo kabob. We plan to go back there. Upcoming Shows: Halloween weekend sees me at CSUN for Urinetown, and then both of us out in Simi Valley for “The Addams Family” at the Simi Cultural Arts Center (Simi Actors Rep Theatre (FB)). The following weekend sees us back in Simi for the Nottingham Festival (FB) on November 7. We then go out to Perris for “A Day Out with Thomas” at Orange Empire Railway Museum (FB) on November 11 (I can’t skip seeing my buddy Thomas and his friend Percy). The following week brings Deathtrap at REP East (FB) on November 14. The weekend before Thanksgiving I’m on my own. I picked up a postcard for “Timeshare” at Eclectic Theatre Company (FB) while at the Colony for Best of Enemies, and it sounded so interesting I booked a ticket for November 21. The last weekend of November is currently open. December brings “El Grande Circus de Coca-Cola” at The Colony Theatre (FB) the first weekend, followed by a mid-week stint as a producer, when we present The Nigerian Spam Scam Scam as the dinner entertainment at the Annual Computer Security Applications Conference (ACSAC). December also has dates held for “The Bridges of Madison County” at the Ahmanson Theatre (FB) and “If/Then” at the Pantages (FB). There are also a few other interesting productions I’m keeping my eyes open for. The first is the Fall show at The Blank Theatre (FB), “Something Truly Monstrous”, sounds wonderful — however, it runs through November 8, so squeezing it in would mean a double weekend. The show at the Kirk Douglas Theatre (FB) also sounds like an interesting exploration of clutter — but “The Object Lesson” only runs through October 4, and I’m not sure we can squeeze it in. As always, I’m keeping my eyes open for interesting productions mentioned on sites such as Bitter-Lemons, and Musicals in LA, as well as productions I see on Goldstar, LA Stage Tix, Plays411.